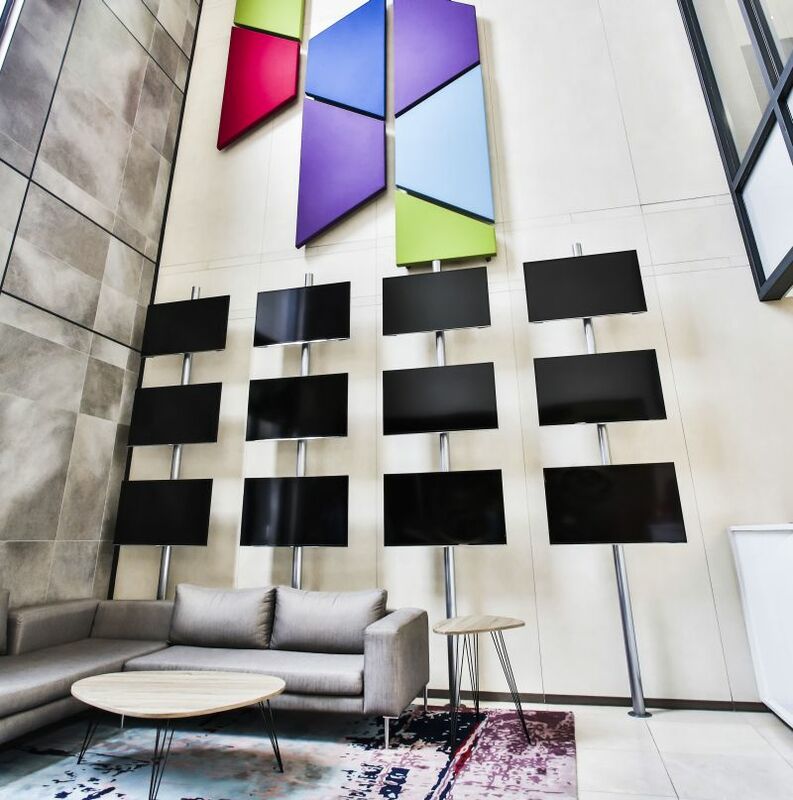 A highlight of the new Anslow Office Park in Bryanston is the retro concrete aesthetic effect of the large-format tile wall features in the two triple-volume atria entrances of Blocks A and B.
Envisioned by Boogertman + Partners, vitrified porcelain tiles, beige and light-grey in colour and in sizes varying from a massive 3m x 1m to 300mm x 600mm, were specified to achieve this effect. In realising this vision, specialist tile adhesives and ancillary products from TAL played a key role. TAL technical supervisor, Sharon Margon, explains that because of the large sizes of the tiles, back-buttering of individual tiles was required to ensure full contact between the substrate, adhesive and tile. In addition, a tile could only be back-buttered once positioned on the scaffolding, or it would have resulted in “skinning” of the adhesive on the ascent, and an impaired adhesive bond. This meant that the workflow between trowelling onto the wall and back-buttering of the tiles had to be absolutely perfect. Installed by tiling contractor Ohlhorst Africa, four to five workers manoeuvred a single tile into place, with one worker trowelling the adhesive onto the wall and another back-buttering the tile, after which the tile was tapped gently into position using a rubber mallet. Adhesive had to be trowelled in a 3m² area in a single operation. These large-format tiles were installed from ground level in a portrait design in order to make up the first segment of the triple-volume installation. Tiling above this point was carried out using various-sized tiles to achieve the required aesthetic effect. 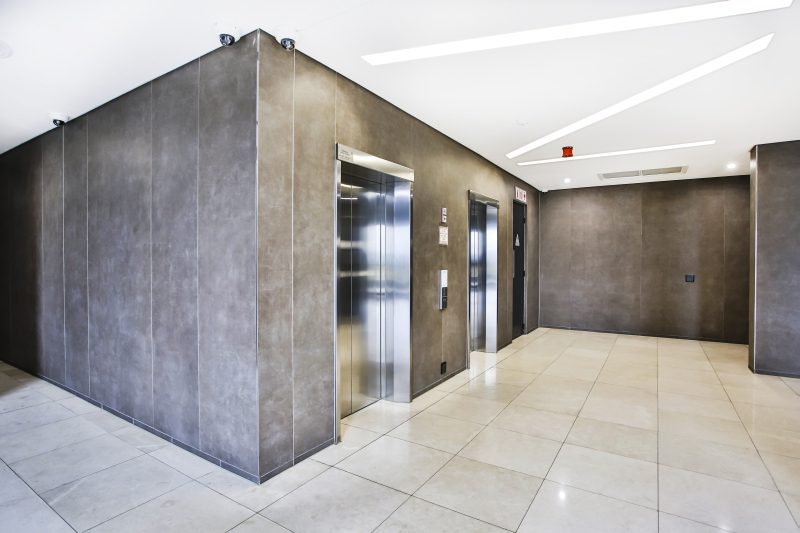 The lift lobby also features large-format tiles in light-grey on the walls. Margon highlights how the different setting times of TAL Goldstar 6 and TAL Goldstar 12 were used to facilitate the tile installation. Because wood-floated plaster can be a relatively porous substrate, which may absorb the mixing water from the adhesive quite quickly, TAL Goldstar 12 was used for application onto the walls. Its longer open and setting times allowed sufficient time for the large-format tiles to be manoeuvred onto the scaffolding and back-buttered, and also to account for any subtle adjustments once the tile had been placed. The backs of the tiles were back-buttered with TAL Goldstar 6. TAL Bond, a modified latex-based additive, was also used as a water placement in the adhesive mix for enhanced bond strength and flexibility, and to allow for any thermal movements arising from sunlight coming through the large windows. Caption main image: Vitrified porcelain tiles, beige and light-grey in colour and in sizes varying from a massive 3m x 1m to 300mm x 600mm, were specified to achieve the retro concrete aesthetic effect of the large-format tile wall feature.